Hi Could you let me know where to find the retailers for HM w igs ... as I cant seem to find them . PM'd you. Look in your inbox. You can always mention the name of wig brands :) Those are acceptable. We keep asking wigs.com to stock Belle Tress, Henry Margu, and various other brands. It's a slow process. Keep in mind that these wigs are primped and probably sprayed.Do you ever watch Taz of Taz's Wig Closet on YouTube? She reviews a lot of Margu wigs and you can see what they look like on a normal person. Yes I have watched Taz on Youtube and she is cute but again she likes to wear wigs with big hair ...lol There is another lady I watch on Youtube but have not seen her in any short wigs as yet, cant remember her name but she mainly does blonde wigs and has accent and I think she may be Polish or something like that I think her site is something like "Sugarfluff and stuff " or similar ..lol oh and of course i like to watch PP on Youtube .... that is why I liked the "EW start " but again what looks great on Pattie, may look terrible on me , so can only wait and see. That's Nisha of Sugarpuffandfluff. She does a lot of reviews. You're right, the swatches aren't good indicators as to how the color actually looks, defintely find video reviews of which ever color you're considering. Some of the HM's do look like a lot of hair, which one are you looking at? I have Kendall, and it's a medium density, not too much hair, not for me at least. I had also ordered Brooklyn, which I ended up returning, the hair on Brooklyn was a lower, finer density. HM Scarlett also looks to be a finer density, so I think it depends on which style you're contemplating purchasing. I had to laugh at your comment on taz and big hair. I seriously just stopped watching her reviews other than to see colors because of how she styles her wigs. I like a little height in my hair but can't imagine wanting such fluffy hair! I love to watch interpretiveoption's reviews. She does a lot of short hair reviews. 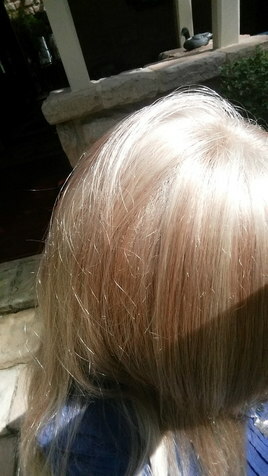 Also, a member of this forum, #crazywiglady, reviews a lot of short styles. Check those two out. Hi Vee, Its good to laugh and yes I did not think about colour from Taz as she seems to do mostly blondes and I am a brunette , but will check her out some more.... I do not think I have come across one called Interpretiveoption's reviews so I will go google for that one as they all do help in seeing not only the colour but another look at how the wig will look on someone who is not just a model who has had it all styled . Yes I have been on Crazywiglady reviews and because of one of her reviews I have purchased the EW "Ever mono" and hope to see it in about 3-4 weeks . I must admit thought that I have a few times liked the look of a wig and then looked at the reviews by some of the lady's and then I have been turned off of them lol. I will link you to one of Debs videos. This is an older review but you can go to her YouTube site from there to see more. I know she reviewed several EW short wigs. I think I've seen you mention this style too. I know exactly what you mean when you talk about liking a wig in a review and then reading bad comments about it later. As much as I love to watch the reviews that Deb does I had to stop ordering a wig just because I liked it on her. It became obvious after two or three tries that most wigs do not fit to my face the same as they do to hers. What I mean is that the sides of some of the wigs go past her ears but nowhere near that length on me. I have to pay more attention to the stated dimensions in the description of the wig. I know now that for a side to reach past my earlobe it has to be at least 3 and 1/2 to 4 in Long. Yes it seems to be easy to do...lol but as long as in the end of my searching I can find something I am happy with ... as I don't have a lot of options with a small head. oh, I'm sorry I thought it was Stay that you had mentioned not Start. But Stay looks awfully cute anyway. Deb shows two wigs in that video I posted above. One is in the color Champagne rooted and one in snow rooted. Have you looked at these colors much? I have looked at the champagne rooted. It looks much more ashy in her video. I don't like contrasting roots, only shadowed roots. As soon as someone buys my Love Love Love, I will buy the Intoxicating spice by BT in CwithAP. Morning Blossomandme, hope you are having a good week. I have been obsessed with "my hair, ie wigs" for years now. I have had a few health issues, and the line in the sand for me was my hair. No matter what, I was not going to look like I had been through the ringer, even tho I had, LOL. I have "my hair", I take spare hair with me whenever I go away, and I always have spare hair at home, just in case something goes wrong, or my hair I wear is discontinued. That spare hair gives me time to stop panicking, look around, and try some different styles. what did you get? I get totally excited when I hear somebody got hair mail! Misty your hubby sounds like a real keeper mine is pretty good too...lol.. I too have had health issues for the last 15 years and that has what caused my hair to start thinning... and my health issues are progressive so I can only go downhill ... but I try to keep a smile on my face and laugh as much as possible as I feel that is they only way I can keep myself from feeling sorry for myself..
and now that I have found this site and all the wonderful people on it who are so helpfull they all make me happy too.. So tell me did you purchase something new online or is this from Brisbane.. and I think you are very smart in keeping extra wigs that are one's that you like , as if they were to discontinue it would be a nightmare. I wore 27T613F over winter, and have gone back to my 24B22 for our warmer months, I pulled out my 27T613F and tried it on yesterday, and I thought "How did I wear this, it is too dark". So funny. I am going to open my HM Violet wig this weekend, and have a play. I bought this almost 10 -12 months ago, and have not been able to get it to look right. 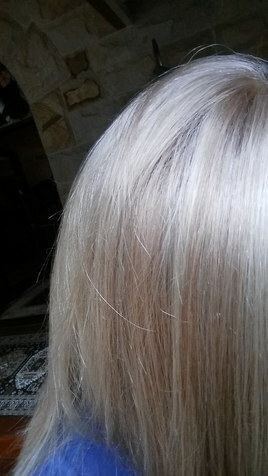 Maybe this weekend :hearts: We are home this weekend, so I am going to have a few hours to play with my hair LOL. I am so sorry to hear of your health issues. It is not always easy to smile through the hard times life throws at us. So many of the wonderful women here have faced or are facing similar life challenges and it is very humbling to see how bravely those hard times are faced. But, we come here and we talk of hair and wigs and styles and colors and we cheer each other own. I'm so happy you found us here. I really miss everyone having their profile pictures here. It was so much easier to remember then everyone's favorite styles! As soon as you mentioned Zara of course I remembered your picture with it on. I'm really surprised that you don't care for the Sarah since I thought it was basically Zara with a body wave. Maybe it was just the color. I've shockedd myself with the wrong color before and know that if a wig is really too dark, or too ashy, or too light it is absolutely going to look horrible on you no matter how much you like the style in the right color. Maybe you'll get the chance to try it someday in a better color. Amen Sister. Still suffering from brown-shock :) @misty I am going to get Zara in the 24B22. It is way lighter than my Champagne with Apple Pie. Please someone buy my Love Love Love! Hi Vee, I thought the Sarah was pretty well the same as Zara too, just with a body wave. Yes, the colour was absolutely horrid on me, really dreadful. The Sarah they had in the store was very off-putting, extremely curly and only came down to the top of my shoulders. Very different to what I have seen on line, or what #Ali looks like in her Sarah (she looks gorgeous, and so natural). The wig I tried on had JR tags, however this store in Brisbane does not keep the wigs in their own JR boxes. Beginning to wonder if it was Sarah? Oh well. Moonlitnight, love to hear what you think of Zara. I hope the 24B22 is not too gold for you? 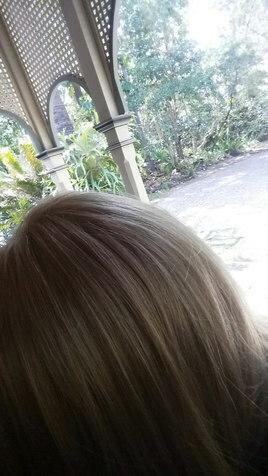 The 22 colour is light ash blonde, which is really pretty highlights. Good morning! :) I don't mind a little gold. I sent it back before but am probably a little more tolerant now. 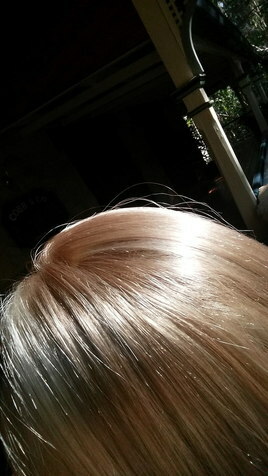 When I first started with wigs, I thought I could find a platinum, but that isn't the case. Sarah is long. I bet the wig you tried wasn't a Sarah. Maybe Heidi with the wrong label. I have the JR colour ring but 24B22 is missing. That is weird as it's not a new colour. Maybe it is in the bottom of my drawer. I sometimes take colours off to test them against Biscuit and in different lights. Yes, now I am over the shock, I don't think it could have been Sarah. This wig shop cuts off the tags, so you don't know the colour or style, and I really think they got it wrong It wasn't a body wave, it was quite tight curls, so different, and definitely not me! I just looked at Sarah again on wigs.com, and definitely not the hair I tried on. Hi Moonlitnight, this is a very close up of my current JR Zara 24B22 for colour comparison. Thank you, yes, I am. It is rainy and I am only up to 12,000 steps and wanted to do 20,000 today. I like to walk at least six miles. Oh my, that looks very ashy! Thank you. It almost looks rooted. I know, I will try and take another photo for you! It is not rooted, so strange. Looks like I should have brushed my hair first LOL, before taking the photos. I wanted to do a close up so you could see the blend. With the three photos, the very first (single, looks like rooted) photo was taken outside in light, the second photo was taken in full bright sun, and the last in shade. Hope this makes sense. Wow 20,000 steps is very good. I average around 10,000 - 12,000 depending on what the day brings. Enjoy your walk with your lovely puppy dogs. Thanks again for these pics. I also watched Heather doing a colour spotlight. She says it is quite gold. I can easily rinse it though. I saw someone do this on YouTube and it really took the edge off the gold. 24b22 is a beautiful blonde! Thanks dc21, it is my go to colour. I love the different variances in the highlights/lowlights. 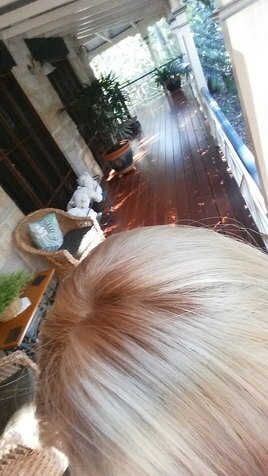 Hi Blossomandme, I think the first photo is the closest to its true colour, however it is strange to see it almost looks rooted, as it is not. Sometimes I get almost a shadow where the part is, and I think that is the way the light reflects on the highlighs. For a while there, my sister and I wore this same colour, and it looked totally different on both of us. Our skin colours changed the way it looked, very strange, LOL. Hi Moonlitnight, this is the HM Violet in 14H. The first photo is taken in natural light, and the second photo in full sun. The first photo Iooks more true to colour. The HM Violet is fully handtied, and ear tab to ear tab lace front. Misty it looks to be beautiful hair ... you are so lucky to be able to wear long hair I envy you. That is just GORGEOUS! I love it. Going to investigate. I Just Bought A Third Violet by Estetica. Do You Purchase Multiples? Happy Monday! Does anyone have a wig purchase planned for this week?